I finished going over the fleche cards and receipts and submitting the results to RUSA. DC Randonneurs had 10 teams with 45 riders start the ride and 9 teams finish with 35 qualifying riders. The preliminary individual finishing results are posted at http://www.dcrand.org/dcr/results.php?page=display-results&year=2010. We will try to get the teams listed soon. • The 2010 award for dedicated captain goes to Team Rouge captain Bill Arcieri, who lost his control card at their second control so didn't qualify as an official finisher, but continued the full ride anyway, guiding his team to an official finish. • The 2010 award for best save goes to Team Anciens and Poets. They got behind schedule due to several thunderstorms and stopping to MacGyver a fix for Randy Mouri's broken carbon handlebars. Since they realized that they couldn't reach the Marriott in time, they found a new 22-hour control and then rode as far as they could to an improvised final control. Just far enough as it turns out (361 km) for an official finish! They also win the award for luckiest team since the receipt that they lost was from the control where I met them in Harpers Ferry. • The longest route was ridden by Team Velo Espresso Gelato at 388 km. • The youngest team was Team Velo Espresso Gelato (Lane Giardina, Ed Felker, Mary Gersema, and Mike Ross) with an average age of 42.5 years. • The oldest team was the Blue Ridgers (Tom Reeder, Hank Greenblatt, Fred Robbins, and Alex Sanchez) with an average age of 60.3 years. The oldest finishing team was the Carnivores (Crista Borras, Bill Beck, Mary Crawley, Chris Mento, Kelly Smith, and Chuck Wood - Grrrrrr!) with an average age of 58.7 years. Congratulations to all of the riders who participated in this year's fleche. I hope most of you had as much fun as we did on the Carnivores. If you're going to attempt RAAM, you need to ride as many miles as you can fit into your life style. Basically, when you're not working or sleeping you need to be riding. It sounds like a simple rule, but is difficult to put into practice. A good start is to park the car and commute as often as you can. For me, that's close to 50 miles each way and will provide the majority of my training miles. The downfall is that it's just over a 3 hour commute (each way). I'll explain this experience in more detail in a future post. Then you need to sign up for as many rides as you can. Preferably, double centuries and longer. Many experience endurance riders recommend 24hour time trialing. This simulates RAAM pacing for the day. Now you have to figure out how to repeat this effort 9-11 more days (depending on your pace) to be an official finisher. I have a number of rides on my calendar for the year. Remembering that annual leave is limited, I have to budget this out wisely. I missed my first 24 hour race (Sebring 12/24) in February. The weather had proven to be too much for the arrangements I had made. I manage to squeeze in a century in March and several hundred miles commuting, but clearly not enough training for what I was preparing for. I rode a 300k in Harrisonburg, which proved to be one of the fastest 300k rides that I have ever done. 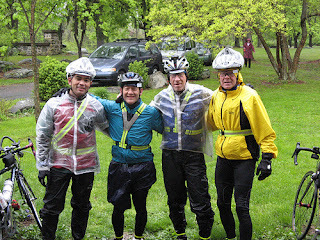 A group of 5 finished the 191 miles in just over 13 hours. This past weekend I rode a Fleche ride. For a description of a Fleche and a story on the ride check out this link by Robert Matz: http://mason.gmu.edu/~rmatz/ride/report.html Robert Matz is an English professor at George Mason University and was riding to raise money for his department. He's new to endurance cycling and is off to a great start. 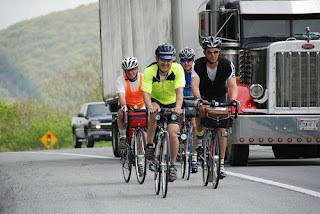 In the photo above, we are cresting over one of the many climbs on 340E heading toward Shepherdstown, WV. The team captain, Dave Goodwin is front right; I'm front left; Rob Matz is rear left and Rick Rosa is rear right. The photo (above) was taken by Bill Beck, a great photographer and our Regional Brevet Administrator (RBA). Our group ended up falling behind on time with our scheduled route, due to the weather, winds, the amount of climbing involved and my broken carbon handle bars which was fixed with electrical tape, duct tape and then zip ties. Click here for images: www.flickr.com/photos/wabeck/sets/72157623890282290/ We ended up rerouting to make it back on time. So we finished successfully, but the RBA will have to approve our rerouting to make it an official finish. After riding for 24 hours, it can be a bit disappointing to not be an official finisher of the Fleche, but it's not the worst thing in the world. I have another Fleche ride scheduled this weekend. Another 24 hours, but hillier terrain, longer distance and a faster pace. It should be fun!!! Just a quick message to give everyone an idea of what's going on here. In 1994, I competed in the Hawaii Ironman Championships. It consisted of a 2.4 mile swim, a 112 mile bike and a 26.2 mile run. In that order and in succession. Many people would say, "Wow, that's incredible!" In fact, that's exactly what I had thought of my Ironman journey until a month later. I was sitting on my couch, catching up on some of my magazine subscriptions. I came across an article in Outside Magazine that was rating 8 of the toughest endurance races in the world. The Hawaii Ironman was rated eighth. Guess what was rated the toughest? That's right! The Race Across America was considered the toughest endurance race in the world and to this day, still holds that title. Over the next 13-14 months, I will share with you my story and my quest leading up to the race day in June 2011. The actual date for 2011 has not been announced, as the current 2010 race is preparing to take place. Inspiring to some, boring to others and just plan crazy to the majority. If nothing else, I hope to bring a little entertainment to the readers of this blog and perhaps share a few things that I have learned and will be learning along the way.